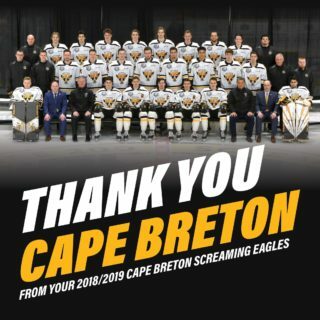 The Screaming Eagles rallied, but couldn’t complete a comeback in a 3-2 shootout loss at home to Victoriaville Saturday afternoon in Sydney. It looked to be an even game in the opening period, with the teams exchanging shot for shot in the opening ten minutes or so. 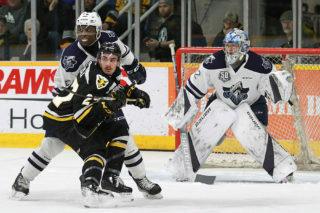 The Eagles began to carry the play in the second half of the period, outshooting Victoriaville 7-0 for a stretch including during a power play opportunity, but couldn’t solve Tristan Côté-Cazenave in the Tigres goal. The game would take a sudden turn towards the end of the opening frame. With less than 90 seconds to play in the period Egor Sokolov was whistled for a minor penalty, and the visitors converted on a pretty passing play on their first shot of their man advantage. Defenseman Dominic Cormier came over the blueline, found Olivier Mathieu in the left circle, who made a cross crease pass for Egor Serdyuk who tapped in the the game’s opening goal. Not long after, Brooklyn Kalmikov was sent off for boarding and the Tigres again would look to be on the power play to finish the period. With the seconds ticking down Cormier fired a shot through traffic that was tipped and with .2 seconds left. Serdyuk had his second of the night and Victoriaville had doubled the lead. 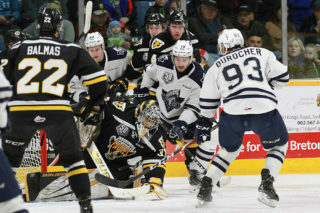 The Eagles heavily outshot Victoriaville in the second stanza in the middle period, 16-4, in an attempt to get back into the game and found their breakthrough from Derek Gentile. He fired a shot into the top corner through a screen at the 4;13 mark, and the 2-1 score would hold until the end of the period. It wouldn’t take long into the third period for the Eagles to find a game tying goal. Mitchell Balmas, who missed much of the second period after being hit in the side of the head with a puck, cashed in on a power play on a one timer from Leon Gawanke and it was a tie game. Following the goal both teams would bottle up the middle of the ice and there were not too many scoring opportunities to come by. That would not be the case in overtime, where the teams traded chances and Côté-Cazenave and especially William Grimard made big saves. In total 11 shots in the five minute period were turned aside and the game went to the shootout. Gentile began the shootout for the Screaming Eagles, but was denied with the block of Côté-Cazenave. Olivier Mathieu took his turn, but was cooly turned aside by the glove of William Grimard. Mitchell Balmas then attempted to break the goose egg but would hit the iron. Serdyuk, after scoring twice in regulation, would prove to have the magic touch. He slipped a deke through the legs of Grimard, putting the pressure on Egor Sokolov to score. 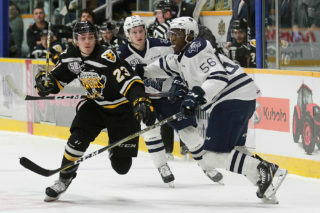 The Eagles forward was unable to match and Victoriaville skated away with the victory. Côté-Cazenave stopped 41 of 43 shots in picking up the victory, while Grimard turned aside 25 of 27 shots in the loss.